Their territory is prime location which is directly in front of the visitor centre, during 2014 & 2015 I followed this pair most closely. Long neck's name is self explanatory, Swans can have 22 - 25 vertebrae, Long Neck must have the full compliment. Little Miss started of as Little Miss Chatty, that turned into Little Miss Greedy & then Little Miss Feisty, so now it's just Little Miss. She is territory obsessed and in the 2 years I have been watching her she has amazed me with her behaviour. 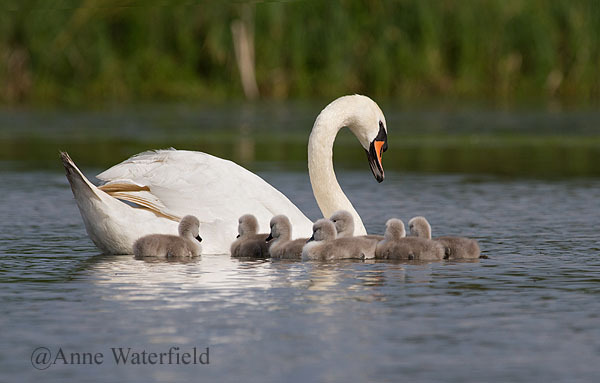 In 2014 she had 7 Cygnets, 5 of which survived to adults.